The Paytm Mall Monsoon sale is still going on and it will last till 19th of July. We have found some interesting deals on laptops that worth taking a look at. The products we have listed down are from brands like Asus, Dell, HP and more. We have picked out some best deals on Paytm Mall from its Monsoon Sale. 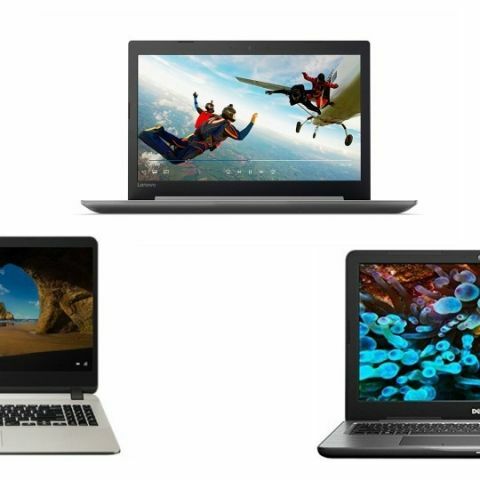 The list consists of a wide range of laptops that are available with a considerable discount along with a cashback on Paytm Mall. The Asus Vivobook sports a 15.6-inch FHD display with a resolution of 1080 x 1920 pixels. The laptop features a fingerprint sensor with Windows Hello feature. The device is backed by an Intel Core i3-6006U 6th Gen processor, with 4GB DDR4 RAM and 1TB hard drive. Click here to buy. The Dell Inspiron 5567 features a 15.6-inch full HD display with a LED backlight. It comes with an Intel Core i3 6th Gen processor with 4GB RAM and 1TB hard drive. According to the company, the laptop battery can last up to five hours on a single charge. Click here to buy. The Lenovo Ideapad 320E comes with an Intel Core i3 6th Gen processor. The device packs 4GB DDR4 RAM and a 1TB drive. The laptop is installed with DOS, which means users need to install the Windows on their own. Click here to buy. The Asus Vivobook 6th Generation Intel Core i3 laptop features a full HD Nano edge bezel display. It is also equipped with a fingerprint sensor that lets users log in without typing a password. The laptop packs an 8GB DDR4 RAM and 1TB hard disk. Click here to buy. The Lenovo 15.6-inch Notebook is backed by an Intel Core i5 8th Gen processor. The device comes with 8GB DDR4 RAM and a 1TB HDD. The laptop has one USB type-C port, two USB 3.0 ports, and one 4-in-1 card reader slot. As per the company, the laptop can last for five and a half hours on a single recharge. Click here to buy.